DOVER, N.H.—Sen. Elizabeth Warren (D., Mass.) told voters they are in for the fight of their lives Saturday morning. President Donald Trump reminded her that evening just what kind of fight it could be. Warren officially entered the 2020 race for the Democratic nomination with a 44-minute speech in Lawrence, Massachusetts, a city with strong ties to the labor movement and steeped in symbolism about what she's trying to fix with her campaign. She wanted to talk about the system being rigged against the middle and working class, about corruption in Washington, about "big, structural change" to protect voting rights and level the economic playing field. After a week where she had to apologize yet again, this time for calling herself "American Indian" on a 1986 Texas state bar registration form, she did not want to talk about Native American ancestry. But Trump does and will. On a day where she promised sweeping, liberal reforms to cheering crowds, Warren was reminded of just what she's up against if she becomes the Democratic standard-bearer. It appeared Trump was referring to the Trail of Tears, the term for the forced removal of American Indians from 1831 to 1850 that resulted in the deaths of thousands of Cherokee and other Indians. Warren's team made sure Native American questions didn't come up Saturday, at least from the press. She wasn't made available to the media after either of her events. In an organizing event Saturday afternoon in Dover, New Hampshire, where questioners were chosen at random from the crowd of 350, no one brought it up. Chris Wayne, a Dover software engineering manager sporting a "Nevertheless She Persisted" shirt, called the controversy over Warren's heritage "super overblown" and predicted Trump's fixation on it would backfire. "I think the only people that are going to be affected by that are people that are already going to be voting for Donald Trump," he told the Washington Free Beacon. "I think he's just riling up his base, and any centrist type person will look at that and see the slurs that Trump throws around and I think it'll be more of a ding on him than her, to be honest. Making remarks about tribal battles and calling her Fauxcohontas, I think that's going to backfire for anybody but his base." P.J. Whitney, a Democrat and a nurse who's lived in Dover for 20 years, was less forgiving but still seemed unbothered. "There's a little bit she needs to clarify there," she said. "She would have still been in her 30s saying she was Native American, and my feeling was she should have figured it out by then. But if that's the one weak spot, then I'm OK with that." "I think it's going to stick with her, just because once it's already in the news cycle, it's already there," Lawrence resident Delante Castle said. Needham resident Beth Kramer assailed the "negativity" around Warren and blamed the press for focusing on it too much. "I think the challenge is this 24/7 media cycle. With all these outlets, they have to cover something," she said. "This is a woman who grew up in real hardship in Oklahoma," she added. "Everything she's done has been through her own sheer perseverance, hard work and grit, and she doesn't get credit for it. She represents the common people who work hard, and that's sort of taken away from her." Warren took questions in Dover about the Middle East (she paid lip service to a two-state solution but also appeared to ding Israel by saying allies should "promote peace"), veteran suicides (she criticized "endless wars" and called for the VA to get more resources), and bipartisanship (she touted a 2017 law she led on getting passed that made hearing aids more accessible). "Thank you for using complete sentences," one questioner said to her in a dig at Trump, to whoops and applause. Warren grinned. Warren got in some partisan shots as well. She ripped Republicans for attempting to "scare people away from the polls" and attacked Trump by name for undermining the "independent press" that holds "our government officials accountable." In her announcement speech, she called the Trump administration "the most corrupt in living memory." 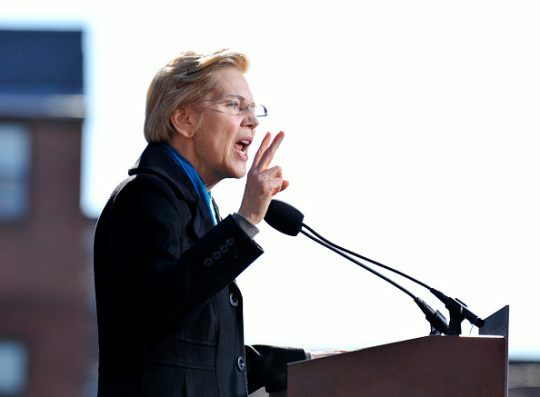 Warren made her Lawrence announcement speech in front of an estimated 3,500 people at Everett Mills, where the 1912 Bread and Roses strike spearheaded by female textile workers began 107 years earlier. She tied her candidacy to the tenacity of the women who brought about labor reforms and pay raises around New England. "Like the women of Lawrence, we are here to say enough is enough. We are here to take on a fight that will shape our lives, our children’s lives, and our grandchildren’s lives just as surely as the fight that began in these streets more than a century ago," she said. Tearing into Trump, she said it wouldn't be simply enough to get him out of office. "The man in the White House is not the cause of what is broken," she said. "He is just the latest and most extreme symptom of what's gone wrong in America, a product of a rigged system that props up the rich and powerful and kicks dirt on everyone else." "Once he's gone, we can't pretend that none of this ever happened," she went on. "It won't be enough to just undo the terrible acts of this administration. We can't afford to just tinker around the edges. A tax credit here, a regulation there. Our fight is for big, structural change." Entrepreneur Maureen McGuinness, who came from western Massachusetts to see Warren announce, effusively praised her but suggested Democrats shouldn't swing too strongly against businesses with their rhetoric. "I think that the Democratic Party needs to include the business sector and fully embrace them and not just focus on the unions, but the businesses, and pull them all together," she said. "We are a community that wants to work together in the future." Whitney told the Free Beacon she was impressed by Warren but wished she had heard her expand on her definition of "Medicare for all." Whitney favors a system that does not eliminate private health insurance. "I don't want to just scrub the whole thing. You just can't do that," she said. Warren, who had effectively been running since December after the formation of her exploratory committee, received testimonials and endorsements on Saturday from several key Massachusetts lawmakers. They included Sen. Ed Markey (D., Mass. ), one of the architects of the radical Green New Deal proposal, and Rep. Joe Kennedy III (D., Mass. ), a friend of Beto O'Rourke. She travels to Iowa on Sunday and will be visiting South Carolina, Georgia, Nevada, and California in the coming weeks. Not everyone in Lawrence was thrilled about Warren. Two women were escorted by a policeman away from where the candidate would be speaking because they were brandishing anti-Warren signs. They wouldn't give the Free Beacon their names. Both White House supporters, one said Warren was an "absentee Senator" who wasn't fit to be president, unlike Trump. "I truly in my heart think [Trump] wants what's best for this country. He may not go about it the right way. He certainly says things that make me go like this," she said, putting her face in her hands. "Sometimes I wish someone would take the phone." A few hours later, Trump welcomed Warren to the race. This entry was posted in Politics and tagged 2020 Election, Donald Trump, Elizabeth Warren. Bookmark the permalink.